Now that we have a definition of tone, let's look at the risks of writing in a bad bad tone by reading the list in the illustration from the bottom up. 1. Your message is ignored. At best, really, the offended party will simply avoid returning the message, regardless of its business purpose. 2. An email war begins. Worse, the recipient may fire back a nastygram, beginning a pointless, venomous war of words. 3. The work is not done. Meanwhile, the warring factions are concerning themselves with the rise in their blood pressure and the cruelty of their retaliatory responses rather than focusing on their jobs. 4. Your message is forwarded. These matters don't stay private for long. Sooner or later, the entire office knows about such petty, lingering linguistic skirmishes. 5. Management intervenes. Now management has to divert attention from the business to chastise or counsel the quibblers. Such interventions can include meetings, follow-up documentation, and maybe official proceedings, all because two people could not maintain their professionalism. 6. 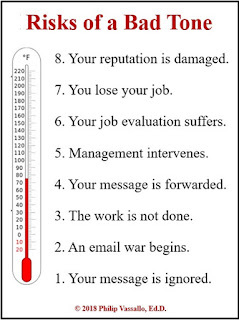 Your job evaluation suffers. The incident has just given the manager something new to write about on the offender's employee appraisal. The issue doesn't just disappear. It could even cost someone a raise or promotion. 7. You lose your job. It has happened. Often, people are fired when management perceives them to be naysayers, complainers, thin-skinned, or rabble-rousers—perceptions whose seeds were planted by the email with the problematic tone. 8. Your reputation is damaged. It doesn't stop there. These diatribes grow into the stuff of legend, extending beyond the department, company, and even field, irrespective of the magnitude of the organizational culture. This post is the first in a series on tone in business writing. I begin with four posts on theory, including this one. This one defines tone in writing, the next describes the risks of writing in a bad tone, the third explores influences on tone, and the final lists general practices for checking tone. The ten posts following these introductory ones present practical strategic tips for creating, improving, or maintaining a reader-centered tone. The tone is the writer's underlying attitude that the reader infers from the message. What writers think about their own tone is insufficient. An employee might succeed in conveying a gracious tone to 11 of her 12 teammates, but the other one might find her tone to be ingratiating. A vendor might believe his emails appear focused to his clients, but some of them might actually find him to be demanding. A manager wants to seem confident to his staff of 40, but half of them might feel he is pompous and the other half strident. Indeed, most people read tone in their own special way, and most usually don't doubt their assumptions. They are certain that they're reading the writer's tone correctly. Why is tone so important in writing? Purposefulness—having a point, getting to it, and sticking to it—is paramount in business writing. But tone is a close second. At the least, people might ignore the simplest of email requests because they perceive a caustic tone in the requester. How can a bad tone prove worse than the work not getting done? The next post will explain. Elmore Leonard was a fiction writer and a wise guy. Many of his best-selling fiction novels became major motion pictures. His top ten tips on writing—and a surprising eleventh—appear in The New York Times article, "Writers on Writing; Easy on the Adverbs, Exclamation Points and Especially Hooptedoodle". Enjoy his tongue-in-cheek approach, but take his suggestions seriously if you want to succeed as a writer. This essay is definitely worth a read. Many people are lamenting the disappearing act of teaching cursive writing in schools. Even teaching print is declining in deference to the Common Core standard of teaching typewriting. Those who dread this change argue that a deep connection exists between handwriting and cognitive skills development. I have always been skeptical about this claim, because typewriting also helps develop cognitive skills. In a New York Times opinion piece, author Anne Trubek doesn't think this evolution will harm childhood education. Should handwriting be left to museums and libraries solely for scholarly analysis of future generations like Ancient Greek and Latin?